Educational public relations is a planned, systematic management function, designed to help improve the programs and services of the school system. It relies on a comprehensive, two-way communication process involving both internal and external publics with the goal of stimulating better understanding of the role, objectives, accomplishments and needs of HCPS. The goal of the Communications Office is to assist in interpreting public attitudes, identify and help shape policies and procedures in the public interest, and carry on involvement and information activities which earn public understanding and support. The Manager of Communications manages and coordinates these communications efforts and serves as the school system's chief spokesperson. The office aims to support the district's mission, vision and goals by building strong relationships with stakeholders, aligning messages for key initiatives and programs, and engaging the community in two-way communication targeted to their needs. The download time for viewing media will vary depending on the speed of your Internet Connection. Harford Cable Network (HCN) now has a channel on Verizon FiOS! Check out these shows on HCN Comcast Channel 21, Armstrong Channel 7 and Verizon FiOS Channel 31. To request a DVD/VHS copy of a program aired on HCN, please contact the Harford Cable Network. This Harford Cable Network (HCN) program is dedicated to featuring positive, kids-oriented current events in Harford County. From local events and sports, to fitness and art, KidsTVNews provides useful information for kids of all ages. This program features the Cool Harford Schools segment, which highlights topics specific to Harford County Public Schools. The KidsTVNews website. Harford County High School athletes from throughout the county go head to head in weekly competition. Sports include football, soccer, volleyball, lacrosse, field hockey, cheerleading, tennis, golf & swimming. For more information about HCPS Athletics, visit the Athletics Home Page. All County Band Concerts held at various schools. For more information about All-County Music Program, visit the Music Department Home Page. Combined chorus made up of vocalists from various high schools throughout Harford County. The Harford County Public School System began an Educator Hall of Fame program in October, 2000. Each month, during the school year, one former HCPS educator is inducted into the Hall of Fame based on their outstanding service to students, colleagues, and the community for at least 20 years. The prospective Hall of Fame members are nominated by the Harford County Retired School Personnel Association and confirmed by the Board of Education. The inductees (or their families in case the inductee is not available or is deceased) are invited to a Board of Education meeting where they are recognized with plaques, certificates from school and government officials, and are prominently featured on the school system website, www.hcps.org. For more information on the program, contact school system Communications Specialist, Lindsay Bilodeau, 410-588-5203. Sheldon Bair grew up in Harrisburg, Pennsylvania, and graduated from Susquehanna Township High School. He went on to earn his bachelor’s degree from Elizabethtown College in 1976. After graduating from college, he made the move south to Harford County to accept a position teaching orchestra at Bel Air Middle School, Homestead Elementary School, and William Paca Elementary School. Mr. Bair was the first in his family to graduate college and credits his high school band director, Mr. Russ Schneck, along with other teachers and conductors in high school, for having an impact in this area of his life. While in college, Conductor Otis Kitchen had the most influence on Mr. Bair. 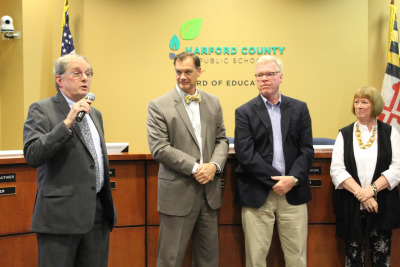 Once teaching for Harford County Public Schools (HCPS), Mr. Bair continued his education by earning a master’s degree from Towson University in 1984. Further study included the Vienna Conservatory, Westminster Choir College, and orchestral conducting with Maestro Leonid Grin. 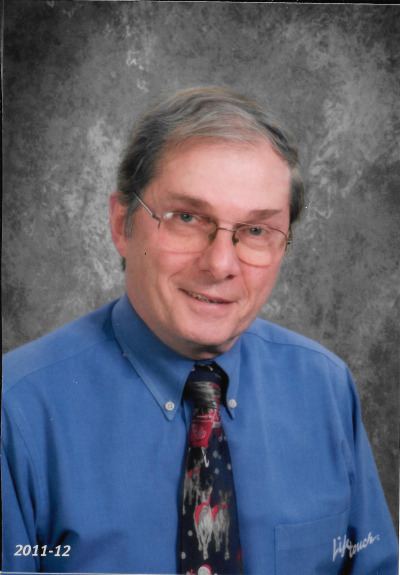 In addition to Bel Air Middle, Homestead Elementary, and William Paca Elementary, Mr. Bair also taught at C. Milton Wright High, Bel Air Middle, Bel Air High, Hickory Elementary, and Southampton Middle schools during his 40-year career with HCPS. As the HCPS orchestra program grew, Mr. Bair eventually taught only at the secondary level, and the last 10 years of his career in the classroom were at Southampton Middle School alone. In addition to teaching orchestra for grades 4-12, throughout the years he also taught 8th grade chorus, percussion lessons, and high school guitar and piano labs. In partnership with C. Milton Wright High School Band Director Scott Sharnetzka, Mr. Bair began area band and orchestra days at which elementary, middle, and high school musicians in the district gathered for a day of rehearsal culminating with an evening concert. The yearly event was hugely successful and added value to the county’s music program. Mr. Bair was instrumental in developing the orchestra program for the Southampton and C. Milton Wright area, growing the string program numbers from about 35 students in 1980 to well over 200 students when he left C. Milton Wright High School in 2006. He was a member of several school and county committees and served as department chair at Southampton Middle for seven years. As the music department chair, Mr. Bair successfully maintained the number of students in band, chorus, and orchestra at more than 50 percent of the student population. Mr. Bair is proud to have been a member of what was one of the best and most balanced of high school music programs. Mr. Bair’s passion for music and his dedication to his students was always at the forefront of his teaching career. He is fulfilled by the number of former students who have gone on to be music teachers, music therapists, performers, and music appreciators. Throughout his career, Mr. Bair received many awards and accolades. In 2000, he was bestowed the Paderewski Award for Contributions to Society and Culture at the Polish Embassy in Washington, D.C. Harford County and the state of Maryland both recognized him for founding and conducting the Susquehanna Symphony Orchestra (SSO), which celebrated its 40th season last year. 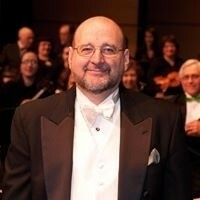 And in 2011, Mr. Bair was honored to be a guest speaker at the Malcolm Arnold Festival in Northampton, UK. In 2016, Mr. Bair retired after 40 years in the classroom with HCPS. In retirement, he enjoys traveling with his wife Barbara of 30 years, as well as cooking and reading. Music continues to be a major part of his life. He is music director of the adult SSO and is also an adjunct instructor at Harford Community College and Community College of Baltimore County. He also works with school and youth orchestras, including summer music camps. Mr. Bair is a published composer and arranger and is a current member of the American Society of Composers, Authors and Publishers. Mr. Bair was nominated for induction into the Hall of Fame by Bonnie Dubel, with endorsements from Bruce Kovacs, William Ekey, and Donald Raff. Stephen Hagenbuch was born in Cumberland, Maryland, and attended Mt. Savage High School in Mt. Savage, MD. He earned a Bachelor of Science in Elementary Education, with concentrations in Biology and Psychology, from Frostburg State College. He then earned a Master of Arts in Educational Administration from the University of Maryland. 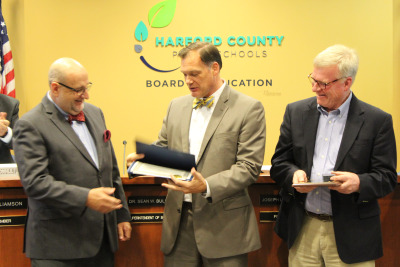 Mr. Hagenbuch received a certificate in Computer Education from Johns Hopkins University and took additional graduate classes at Towson State College, the University of Connecticut, and Johns Hopkins University. In 1970, Mr. Hagenbuch and his wife Meredith moved to Harford County upon graduation. At that time, Harford County Public Schools offered the highest starting salary in the state, and his wife taught first grade at Old Post Elementary School. The first in his family to graduate from college, Mr. Hagenbuch worked for just one year for the Health Department before returning to his first love, teaching. The majority of his teaching experience was at Hillsdale Elementary School where, over the course of eight years, he taught fourth grade, sixth grade, non-graded primary, and the High Intensity Learning Systems Reading Lab. In 1979, Mr. Hagenbuch was appointed assistant principal at Edgewood Elementary School where he also taught third grade. After one year, the primary building at that two-building school was closed and Mr. Hagenbuch was transferred to the assistant principal position at Hickory Elementary School where he also taught fifth grade. Again, just staying one year, he was returned to the classroom full-time at Meadowvale Elementary the next school-year due to budget cuts in administrative budget categories. His stay at Meadowvale turned out to last just five months when he was returned to an assistant principal position in mid-year at William S. James Elementary. There, he also taught fourth grade. In 1985, Mr. Hagenbuch was appointed principal of the Norrisville Elementary School where he also taught a reading group. In 1990, he had the opportunity to lead the opening of the new Ring Factory Elementary School. In 1998, Mr. Hagenbuch’s eighth stop and final assignment in Harford County was at Youth’s Benefit Elementary School. 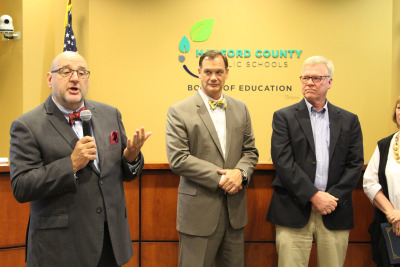 In 2001, after 30 years in Harford County, Mr. Hagenbuch went on to serve as principal for Montgomery County Public Schools, followed by nearly eight years as assistant to the superintendent and principal in the South Eastern School District in Pennsylvania. 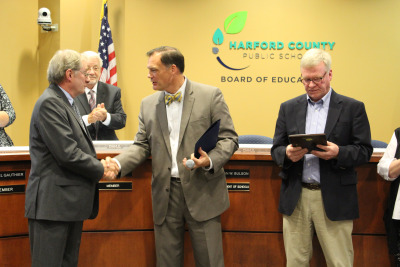 Throughout his career in Harford County, Mr. Hagenbuch led numerous initiatives including Second Grade Social Studies Revision Committee, Report Card Revision Committee, Gifted and Talented Summer programs, and Textbook Selection committees. A hallmark of his work was service to local, state and national professional associations. Mr. Hagenbuch served as membership chair, legislative chair, editor, and president of the Maryland Association of Elementary School Principals. In addition, he served as a member of the COMAR Review committee. He also served on the Nomination Committee and Teller’s Committee for the National Association of Elementary School Principals and on the Council of Chief State School Officers’ Professional Standards for Educational Leaders Review Committee. Mr. Hagenbuch was a formal and an informal mentor for numerous principals and assistant principals and was nominated as National Distinguished Principal in both Maryland and Pennsylvania. Mr. Hagenbauch and his wife are both retired and living in Ocean Pines, MD. Their son Chris is a principal and their daughter Alison is a speech language pathologist. Both have two children. Mr. Hagenbauch was nominated for induction into the Hall of Fame by Joan Marcus with endorsements from Martha Elliot, David Cooper, Jaqueline Leach, and Patricia Skebeck.